People walk on Chicago Avenue. Evanston’s We’re Out Walking program, which promotes an active lifestyle, is celebrating its 10th anniversary. 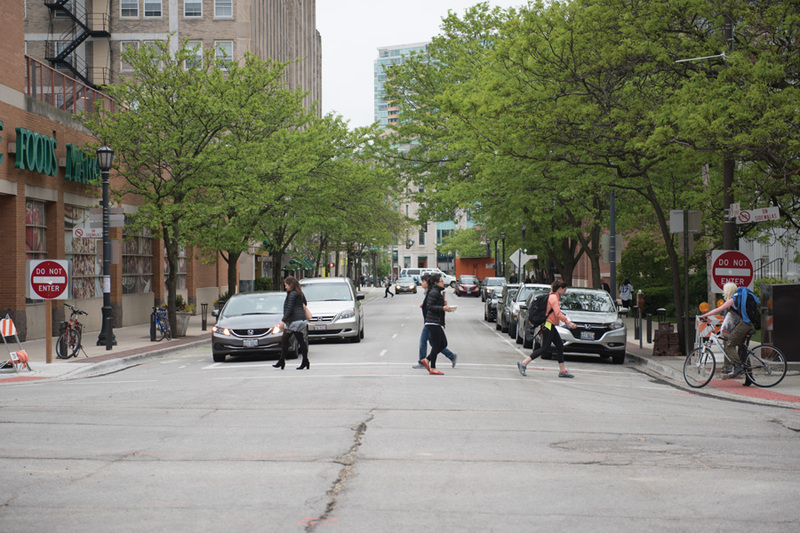 We’re Out Walking — a program that encourages Evanston residents to lead active and healthy lifestyles — began 10 years ago as Women Out Walking with the goal of getting 50 women in the community to become more active. That goal was far surpassed when 500 women signed up in the first year and committed themselves to improving their health through walking. Now in its 10th year, WOW has expanded to include community gardening, nutrition workshops, women’s health issues and cooking demonstrations. The program kicked off its annual 12-week program Saturday at an event at Evanston Township High School. The name change reflects a desire for the program to be more gender inclusive, said Evonda Thomas-Smith, Evanston’s health and human services director. The program has no plans to end soon, Thomas-Smith said, adding that it has helped develop a sense of community among residents and neighbors. “The one component that we did not expect that just organically occurred is the community connection,” Thomas-Smith said. Jonathan Webb — now the vice president of corporate alliances and grants for the American Diabetes Association — previously worked in the city’s Health and Human Services department and helped launch WOW in 2007. Thomas-Smith said Webb was instrumental in reaching out to community groups and residents to start the program, which was supported by a grant from the Illinois Department of Public Health. WOW challenges participants to track their steps while walking and to join others in living an active lifestyle. Participants pay a $10 membership fee and have access to group walks and health and fitness classes, Thomas-Smith said. The program was recognized with an award from the U.S. Conference of Mayors for increasing city livability in 2012. Participants can add and discover walking routes on the city’s website. At the end of the program, walkers are rewarded for their tracked steps through prizes donated by community businesses and organizations. More than 30 businesses and community organizations — including Northwestern and Evanston/Skokie School District 65 — sponsor the program and donate prizes. Alan Anderson (McCormick ’99, Kellogg ’04), Northwestern’s executive director of neighborhood and community relations, said the University recognizes the importance of WOW in promoting women’s health and public health in Evanston. Several WOW participants spoke during a City Council meeting in April about the program’s positive benefits. Evanston resident Willie Shaw said during the meeting that participating in the program has improved her health and allowed her to meet a diverse group of people. “Even after many years of living here, I had never walked past or enjoyed as much of Evanston’s scenery as I have participating in the WOW program,” Shaw said. Evanston resident Linda Mathis said the inclusivity and accessibility of the program makes it beneficial for the entire community. “I strongly feel that whatever age you are or whatever fitness level you are at, WOW is the perfect program for everyone,” Mathis said.